Over the past couple weeks we’ve been rolling out high resolution wind forecasts for the California coast. The forecasts come from the High Resolution Rapid Refesh model, offering 3 kilometer (1.8 mile) resolution every hour, 15 hours out. This is as good as it gets: no more missed evening glass-offs or side-offshore scores. 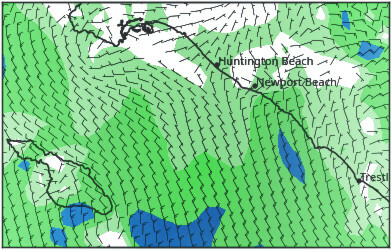 To make the most of the 15 hour forecast, Swell Matrix fetches it at 6:45, 11:45, and 8:45 Pacific time. Since we also want to know the wind farther out, and only want the best, we added an overview that goes out a ridiculous 16 days. While not 100% accurate at that length, it’s very good in the short/ medium term and is useful for getting a general idea of the weather in the next couple weeks. We’ll be adding more areas in the near future (L.A. anyone?) so if you want us to cover your hood give us a shout by email or in the comment area below.